After her plane crashes, a seventeen-year-old girl spends eleven days walking through the Peruvian jungle. Against all odds, with no food, shelter, or equipment, she gets out. A better equipped group of adult survivors of the same crash sits down and dies. What makes the difference? Through close analysis of case studies, author Laurence Gonzales describes the essence of a survivor and offers twelve "Rules of Survival." In the end, he finds, it is what's in your heart, not what's in your pack, that separates the living from the dead. This book was not what I expected. With that said, it was so much more than a series of survival tales. The author, who is clearly well studied in this field, covers the spectrum from the neuroscientific study of survival, to the survivor attitude. 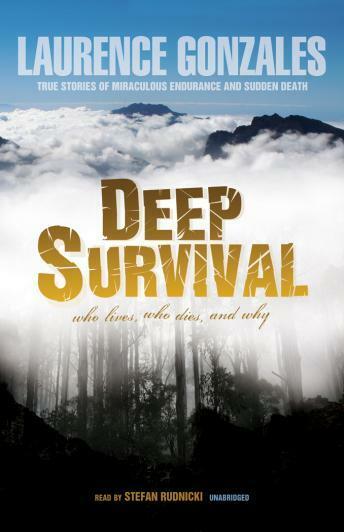 This book is as much a self-help book for surviving day to day life as it is for surviving being lost in the wilderness. Fantastic read.